The charts shown above, for Edgar Cayce and David Wilcock, born 96 years apart, show an amazing similarity in soul and personality. In studying and practicing the Divine science of Astrology for over twenty years, I have never seen such a remarkable re-convergence of the ‘personal’ planets (Sun, Moon, Mercury, Venus and Mars). The charts show a remarkable sameness between these two men beyond all chance or ‘coincidence’. For simplicity’s sake, I will write in present tense regarding Edgar Cayce to avoid such verbal malaprops as had/have, was/is etc. First of all, what leaps out at the astrologer is the fact that all five personal planets are in the same signs in both charts. I am not the mathematician I would like to be, but the order of odds against such a lineup is very high (see sidebar), when you consider the chances of one conjunction of a pair of personal planets to be on the order of 1:18 (giving a ten degree orb either way). The odds of having five pair of inner planets conjunct is nothing less than phenomenal! In our look at these five pair of personality determining planets, we see first that the Moon in both charts occupies the 13th degree of Taurus, the sign of the Moon’s exaltation, and in the degree associated with the number of Lunar cycles in a year. This is an amazingly exact conjunction (1 in 360) normally indicating a very high degree of compatibility and comfort between two people. In synastry (syn- means same or similar and -astry means stars or planets; that is, the study of compatibility between two people) having Moon conjunct Moon usually is deemed the highest order of compatibility; followed by Moon conjunct Ascendant and Moon conjunct the Sun. By the way, the Moon is the most important planet for compatibility as it connotes soul, emotional responses, comfort level with others, and receptivity to others. So, already we see that the level of emotional harmony between Cayce and Wilcock is outstandingly rare. Were they brothers, they would be as twins, practically inseparable. The other exact conjunction is between Wilcock’s Venus and Cayce’s north node of the Moon. The Lunar nodes are two points (north and south) on a line in space formed by the plane of the Moon around the Earth and the plane of the Earth around the Sun. From high school geometry we know that when two planes intersect, they form a straight line. This line extends into space and moves slowly retrograde – one cycle lasts ~18.6 years. When the Sun, in it’s annual journey around the zodiac, comes close to either the north or south nodes, a pair of eclipses will ensue, usually two pair a year. Now the north node is taken by most astrologers to mean qualities that our souls seek to imbue themselves with. The south node is generally regarded as the qualities we have. So, W’s Venus exactly conjunct C’s north node indicates to me that Wilcock values the qualities that Cayce sought, and to a large extent did achieve. The fact that they are exactly conjunct says to me that Wilcock’s 4th chakra is qualitatively the replica of Cayce’s dream of his reward for a lifetime of altruistic service to others. It does not mean that neither man is without flaw, but Venus in both men’s charts is exalted in Pisces, where personal love can more easily become universal love. Both men have Sun in Pisces, which essentially means that they are both psychically sensitive and spiritually oriented with compassion for suffering, and a life mission of spiritual growth and development of intuition. Unity and inclusiveness are a theme of Pisces. Cayce used an unconscious trance state, Wilcock uses dreams – both are Piscean approaches to higher awareness. Although, it must be said that Wilcock’s approach is much more conscious and thus probably more skillful. If so, this is a natural progression from one life to the next, as developed talents have a way of begetting greater gifts. Both these men devote themselves to greater spiritual awareness and compassionate alleviation of suffering. They both have Mercury in Pisces, enabling them to explore their own psychic realms with skill and understanding of the symbolism used in working with the deeper reaches of human consciousness and spiritual awareness. Mercury in Pisces indicates a fluid state of mind in which images and feelings are dominant and the psyche is very impressionable. Wilcock’s Mercury is conjunct Cayce’s Sun, indicating an awareness of Cayce’s life that is likely to convince any doubters that Wilcock is aware of many of the hidden details and secrets of Edgar Cayce’s life. These will probably come out as required to allay fears and create better communications between the A.R.E. and David Wilcock. Both men have Mars exalted in Capricorn, making it easy to see how their devotion to their work, their service, is the great strength of their characters and gift to humankind. Cayce had a wide Mars Jupiter conjunction, showing a need for freedom to do his own thing rather than be tied to a job and salary. Even before Cayce began to give readings, he determined to work for himself. It also indicates that he wasn’t afraid to speculate on risky ventures. Wilcock has Mars conjunct his North Node and thus is likely to be a prodigious worker, devoting himself for long tireless hours in pursuit of his superconscious Muse. We come now to where their dharmas divide, if you will. The most noticeable difference between Cayce and Wilcock is in their rising signs, or ascendants. The ascendant is our face, appearance and the screen through which we express ourselves. In their charts the ascendants are as different as can be. Cayce had Leo rising, and thus a strong urge to express himself and to accept what issued from him in trance. While not a proud man in the sense that he was always banging his own drum, Cayce did have enough self-assurance that made it possible for him to go beyond his fundamentalist upbringing. To be sure, it didn’t happen overnight, and I’m sure there was some anguish over leaving a pat religion behind. But he did accept the truth of his Spirit and became a strong proponent of his larger being’s perspective. David Wilcock, on the other hand, has Scorpio rising, and so he has a more difficult field to hoe. Scorpio is the most difficult ascendant because it is not naturally self-expressive, and that is the function of the rising sign – to express the various energies of the entity. With Scorpio rising, (ruled by Mars and Pluto) Wilcock works hard (Mars in Capricorn) to express himself in a manner that is so beyond dispute as to carry the day. And although he works hard to get beyond any critical noise, Scorpio rising will never back down from a dispute out of fear. So no one should be confused by this Piscean’s willingness to get along, that he would not fight vigorously for what he believes, and that he is not afraid to admit his darker aspects. Without going into great detail about the outer planets Jupiter through Pluto, I want to mention a few remarkable facts. Cayce’s Jupiter was in Capricorn, lending an authoritative tinge to his higher self. Wilcock’s Jupiter is in Aquarius (the sign following Capricorn), which means that he has a more egalitarian and New Age quality to his higher awareness. Jupiter in both charts is in the 3rd degree of their respective signs, giving another glimpse of similarity and progression. Cayce’s Saturn was in Pisces conjunct his Mercury and Venus. This is often perceived as one having a somewhat formal rectitude with a great precision, and brevity bordering on the austere. Wilcock has Saturn in Gemini (similar to Saturn conjunct Mercury) which places emphasis on working to master communication with clarity and substance, which he has shown so well in his books and readings. Saturn in Gemini often manifests a writing ability, usually later in life. Both charts have Chiron, the wounded healer, in Aries, which usually indicates a wound in one’s sense of self, masculinity or ability to assert oneself. It seems somewhat unfair that David Wilcock must journey through life always being compared to America’s greatest psychic. It appears to me that establishing a comfortable identity may always present David with a creative challenge. Neptune, as ruler of Pisces, plays a central role in both men’s charts. 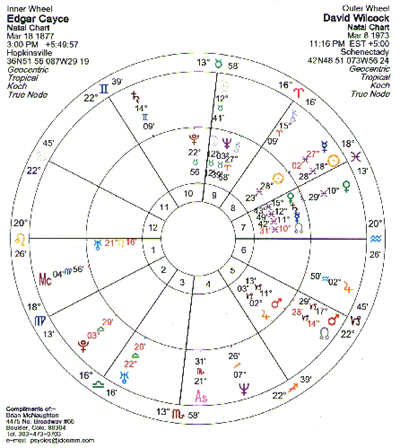 In Cayce’s chart, Neptune is conjunct the Moon in Taurus. Moon-Neptune conjunctions are well known for acute emotional sensitivity and true psychic ability. Wilcock has Neptune in his 1st house where it refines his self-image, opens him to oneness with all, and activates his psychic senses. Neptune in the 1st usually makes the individual prone to be a reflecting screen for others’ projections. Pluto is conjunct Cayce’s Moon, which made it difficult for him to break with his family’s religion and heritage, but made the break necessary and very transformative. Wilcock has Pluto in Libra and widely opposing his Mercury. This gives David a deep and penetrating mind, capable of splendid research which transforms the way he (and we) look at our world. I could go on for many pages about the parallels and paradoxes between these two wonderfully gifted men. But it is not my intention to put on an astrological workshop here. I am pleased to help a bit in the further understanding of a rare phenomenon – a personal look at the reincarnation of one of the world’s most gifted and capable psychics. The fact that Edgar Cayce worked himself to an early demise likely accounts for the incredible number of contacts between his chart and Wilcock’s (see sidebar). If, as is likely, we return to the third dimension and human form when we have left it before our life has reached it’s natural conclusion, it is reasonable to expect that we will return to resume what we wished to accomplish in the prior incarnation. Therefore, it is easy to understand the numerous recapitulations of Cayce’s chart in Wilcock’s chart. Although David Wilcock is quite a young man, his accomplishments prove his promise, and indeed make it easy to suppose that he is the reincarnation of Edgar Cayce. To those who resist or deny this conclusion, I say an open mind is a requirement for learning and growing. If anyone closes their mind to the fairly obvious conclusion that David Wilcock is the reincarnation of Edgar Cayce, I urge them to remain open to the possibility, because you cannot know for sure one way or the other until you have personal knowledge. I remain open to realizing the reverse of my present belief. In order to ascertain the frequency of the astonishing number of planetary conjunctions between Cayce’s chart and Wilcock’s chart, I have researched the planetary tables for over one hundred years. I searched the period from Cayce’s birth in the year 1873 to the year 2000, to find another year in which the personal planets (Moon*, Mercury, Venus and Mars) were in the same signs as Cayce and Wilcock. It may help you to know that Mercury is never farther than 28 degrees from the Sun, and Venus is never more than 48 degrees away from the Sun. Thus, when the Sun returns to its place each year on or about one’s birthday, Mercury will never be more than a sign away from the Sun, and Venus will never be more than two signs away from the Sun. The Moon and Mars may be found anywhere in the zodiac, irrespective of the Sun’s position. What I found is recorded below. (The Sun is not included in this search because it is always back at its starting point on the same day each year). So, all four planets haven’t been back in the same signs as Cayce and Wilcock on March 8th since Cayce’s birth, except at Wilcock’s birth. And three of the planets have returned to the same signs on March 8th – once-1954. * I restricted the Moon’s return to the 13th degree of Taurus, rather than anywhere in the sign of Taurus to give a truer idea of the frequency of Lunar return on the day of Wilcock’s birth. Had I used the return of the Moon to any degree of Taurus on the 8th of March, the number would have risen greatly and would have yielded a less accurate perspective. I have received nothing in return for this analysis other than the possibility of new clients through this website. BJM. – Brian McNaughton was born on Jan. 28, 1948 and currently resides in Boulder, Colorado. He first became aware of Edgar Cayce while serving as a medic and operating room technician in the U.S. Army Hospital in Stuttgart, Germany in 1970. He ravenously read all he could about ‘the sleeping prophet’, and hoped to one day serve as well. He found David Wilcock’s website through Joe Mason’s cornucopia website www.greatdreams.com. This is an amazingly precise conjunction (1 in 360) normally indicating a very high degree of compatibility and luxury between 2 people. In synastry (syn- suggests that same or similar and -astry suggests that stars or planets; that’s, the study of compatibility between 2 people) having Moon conjunct Moon usually is deemed the very best order of compatibility; followed by Moon conjunct Ascendant and Moon conjunct the Sun. It is not as unusual as you make it out to be! The personal planets are clustered within a couple signs plus or minus of the sun sign, with the exception of the Moon, due to overlap of their respective synodic cycles. You can’t have sun in Pisces and Mercury in Virgo, for example. Check out an ephemeris and you will see the way this works. Hello Brian, I just was looking for Edgar Cayce astrology info and I fell here and read your comparison between David and Edgar’s astrological chart and I am blown out of my mind, it happens that my birth date is also March 8, 1973 at 10:45 P.M. in La Paz Bolivia, my chart and Davids chart are almost identical, so I also share the same aspects as David with Edgar, id that crazy or what? I love astrology, and I am always researching to learn more about my natal chart, so it can help me find out my souls purpose, even though I think I know it, it will always help to have some guidance along the way. Thank you for sharing your knowledge, much love.